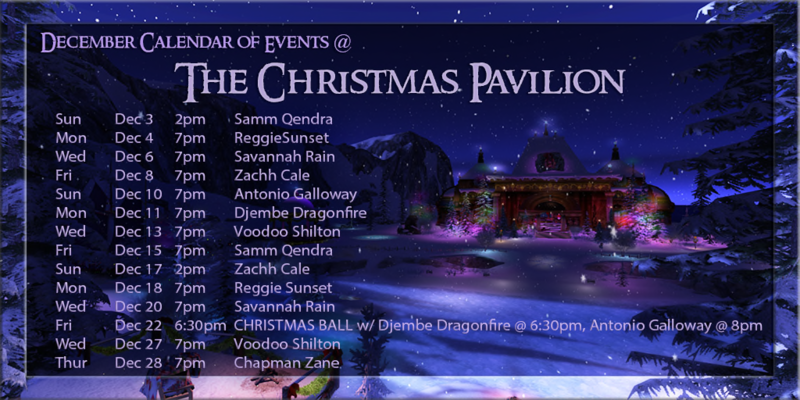 Voodoo Shilton TONIGHT at The Christmas Pavilion live music venue 7pm SLT! #SecondLife Join us for live music featuring Voodoo Shilton, 7pm SLT at Calas Galadhon’s Christmas Pavilion – here’s your sleigh ride to The Christmas Pavilion! And, early or later, come enjoy the most beautiful Christmas in Second Life🙂 Skating, balloon rides, WH Reindeer, Comet the Reindeer Tour, cross-country skiing, sleigh rides and lots of cozy places to cuddle and the gorgeous Christmas Pavilion, too!